Now, tea is making a comeback in the kitchens of the more experimental chefs as a creative way to add a little something extra to dishes. Just like spices, tea comes in flavors. 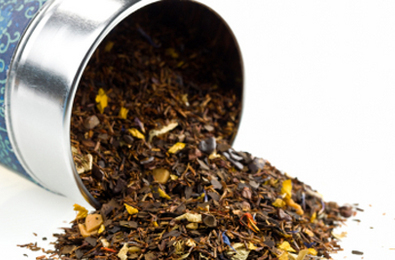 White tea, from young leaves, is subtle with floral and citrus notes. Green tea can have a light, smoky flavor with grassy notes. Some Oolong teas have floral, fruity or spicy hints, while others have more roasted flavors. Black tea, the most commonly consumed tea worldwide, is astringent, and its flavor varies dramatically among regions. And like grapes used in wine, tea leaves come in varietals. Their colors, fragrances and tastes are products of climate, soil, altitude and rain–factors that are collectively known as terroir. With all this variation, tea experts and aficionados recommend that you let your own palate guide you. “Each tea is individual and should be tasted first to find its predominant characteristic–is it sharp, soft, citrus, earthy or smoky?” Rosen says. “Then it can be matched with a recipe.” She suggests using intense teas when preparing intense-flavored dishes, and pairing delicate teas with delicate foods. “Sweet, grassy, green teas are wonderful in salads or with briny shrimp or egg dishes; black tea is great with meat or poultry, and it’s delicious in fruit compotes, where it cuts the sweetness,” she says. “Fruity teas are good for ice cream or egg sauces.” When cooking with tea, Rosen suggests experimenting with the flavors and using good quality tea. She cautions novice tea-cookers to take care not to cook the tea for too long and to go easy with the amounts used. And not to worry–cooking with tea is safe for the kids. With these delicious tea-infused recipes, soon the brew will have a permanent home in your spice rack. Heat up the kettle and start cooking! Tea Tips: Here are the easiest ways to incorporate tea into your regular cooking routine. • Place a tea bag in warm oil or butter for a few minutes to add flavor. Stir gently, cool and refrigerate. Flavored oils can be served in salad dressings or drizzled over soups. Tea-infused butter is a hit on pancakes and in pastry recipes. • Use brewed tea instead of water when cooking rice or pasta. • Infuse stocks for soups or sauces by placing a tea bag in them. • Sprinkle tea on any food to season before cooking. Perfect Pairings: Chas Kroll, executive director of the American Tea Masters Association, offers these suggestions when choosing tea to go with a particular food. Whether you’re sipping a brew or infusing the whole dish, these food-and-tea pairings are culinary matches made in heaven. Kiwi magazine is ideal for families interested in a healthy lifestyle. They cover the latest in natural and organic products, nutrition and wellness. You’ll find information on social and environmental issues that touch your family as well as parenting advice from leading experts. And, of course, there’s fun stuff like kids’ fashions, reviews on kids’ media, toys and games. We’ve even thrown in some information for pampering parents, too. Subscribe now and Kiwi will make a donation to World Vision. Fascinating, new uses for teas! Soak dried fruit in cold tea before making fruit cake. Fruit is jucie and cake keeps moist longer.